The Ebb-Tide: A Trio and Quartette (written in collaboration with Lloyd Osbourne) begins on a beach in Papeete, Tahiti. Herrick, Davis and Huish are unemployed, unhappy, and impoverished beachcombers. Robert Herrick’s respected family had high expectations for him, but he was never able to make a success of his life. He was fired from every job, and moved from place to place. Eventually, he stopped writing to his family. Captain John Davis was married with children. He commanded the Sea Ranger, but was drunk and the ship sank, drowning six men. He was so ashamed he had never returned home. Huish is a cockney clerk who neither David nor Herrick like. The three men have been living under various aliases to avoid recognition. One day, Davis says he has been commissioned to captain the Farallone. The ship was bound for Sydney with a cargo of champagne but the crew were struck with the smallpox and died – Davis will now complete the journey. Davis, however, plans to steal the schooner and take it to Peru. With Herrick as mate and Huish on board they can make a fine profit from the champagne and selling the ship. They can then try to start their lives again. Herrick is at first reluctant to take such a criminal step. Davis reminds him, however, that they can use aliases so no one will connect them with the theft. At last Herrick agrees and the three men hire a crew of Kanakas (Pacific Islander workers). Once on board, neither Davis nor Huish are able to refrain from drinking the champagne. Davis is drunk throughout the journey and is unable to captain the ship. Finally, Herrick confronts Davis and tells him he is danger of repeating the events of the Sea Ranger. Davis realizes his folly and tells Huish there will be no more drinking on board. Unrepentant, Huish opens another bottle of champagne, but it is filled with water. The men open bottle after bottle, but they are all filled with water. The three are now anxious and suspicious about their sham cargo. Matters are worse when Davis looks at the ship’s supplies and sees they are almost gone – he had squandered them when he was drunk. Luckily, they spy land in the distance. The shipping guide says it’s an island with private interests. Hoping it’s a pearling island, the men head for shore. As they approach, Captain Attwater rows up to them. A huge and malignant man, Attwater is also zealously religious. He has started a colony and a mission on the island and makes a profit by fishing for pearls and shells. Because of an outbreak of the small pox, of the 33 people originally on the island, only 4 are left. Attwater insults and condescends to Davis and Huish, who resent him. He takes a strange liking to Herrick, however, and invites him ashore. He tells the other men to come for dinner later. Davis and Huish now become greedy. Convinced that Attwater has been stockpiling pearls they give Herrick an ultimatum: either he bring Attwater and his pearls back to the ship, or they will kill Attwater. “[he] had complied with the ebb-tide in men’s affairs, and the tide had carried him away; he heard already the roaring of the maelstrom that must hurry him under” (p. 105). When the men come for dinner, Attwater tells them a chilling account of how he killed one of the natives. Herrick tells Davis they should leave immediately – he fears that Attwater is too intelligent and powerful. When Davis tries to shoot Attwater, Attwater is ready with a gun. He tells the men to leave or he will kill them. Back on board the Farallone Herrick is overcome with depression. He tries to drown himself but cannot bring himself to do it. He swims to shore and, with no other options, returns to Attwater. Meanwhile, Davis and Huish plan their next step. Huish carries a letter from Davis to Attwater. He plans to throw vitriol (sulphuric acid) when Attwater gets close enough. Attwater is suspicious, however, and shoots the moment the vial leaves Huish’s hand: Huish dies. Attwater now points his gun at Davis. He tells him he has 60 seconds to make peace with God. When Davis says he won’t trouble God, Attwater shoots all around him, grazing his clothes and his hair (this is a skill he bragged about earlier). Terrified, Davis asks for God to take care of his children. He faints, and Attwater says he is a true penitent. 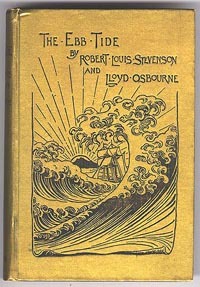 Quotations from The Ebb-Tide, The Works of Robert Louis Stevenson, Swanston edn, vol xix (London: Chatto and Windus, 1911). Later, Davis is praying on the beach. A schooner is arriving and Herrick plans to leave with it: he has burned the Farallone, destroying their connection to it and the sham cargo. Davis, however, is now a believer – he wants to stay with Attwater where he found peace.